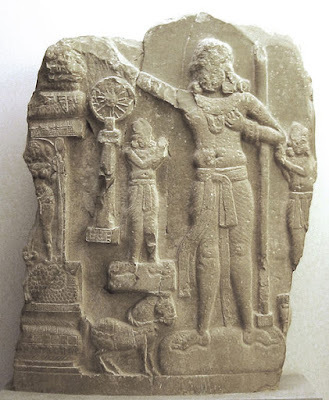 Did Ashoka’s embracing Buddhism and promoting Ahimsa Weaken India? Past is used by communal politics for their present political agenda. In India on one hand we have the use of medieval history where the Muslim Kings are presented as ‘aggressors due to whom Hindu society had to suffer’, on the other now we are witnessing the distortion of ancient history being marshaled to undermine Buddhism vis a vis Brahmanism. The figure chosen to make this point by communal forces is that of Emperor Ashoka. Incidentally Noble Laureate Amrtya Sen regards Ashoka and Akbar as the two greatest Emperors to have ruled India. A publication from RSS progeny, Rajasthan Vanvasi Kalyan Parishad claims that it was due to Ashoka’s conversion to Buddhism and his promotion of ahimsa that India’s borders opened up to foreign invaders. It also goes on to say those followers of Buddhism under Ashoka played a seditious role, they assisted Greek invaders with the goal that they would destroy “Vedic religion” and restore Buddhism. Here, what is being referred to as Vedic religion is Brahmanism as such. Interestingly the article regards Ashoka to be a great ruler till he embraced Buddhism, while most of the thinkers show that his humane policies, making him a great emperor, were brought in after he embraced Buddhism. There are many components of this formulation which are concocted as per the political requirement of Brahmanical Hinduism. One of these concoctions is the very notion of India being the state from times immemorial. One understands that India as a nation state emerged during freedom struggle. The earlier formations were kingdoms, Empires. The boundaries of these kingdoms were not fixed and depending on the bravery and other associated factors kings were expanding their area of rule or had to retreat into smaller areas or even getting decimated at times. Even before Ashoka came to power Alexander had attacked India. Such forays of kings into other territories are not unknown. Mauryan Empire was a major Empire the sub continent has seen. So many dynasties have ruled large parts of the subcontinent, no single ruler has ruled whole of what is India today. So why is Ashoka being targeted today? Ashoka was successor to Bindusar, from Maurya lineage. Chandragupta Maurya had built the Empire and Ashok’s annexed Kalinga (modern Orissa) into his kingdom. This battle was very bloody and as is famously known the bloodshed shook Ashoka and he decided to embrace Buddhism. From this point on the transformation of an aggressive insensitive king to a very humane person began with the embracing of Buddhism. He undertook the measures for welfare of the people, opposed the Brahmanical rituals and opened the gates of his palace for listening to woes the people of his empire. Inspired by the teachings of Buddhism he took steps towards building a compassionate state, the guardian state. His ideas and polices are deciphered from the number of edicts carved on pillars and stones which are vast in number. What emerge from these edicts are very compassionate and impressive norms being propagated as back as in the period of third Century BC. What is remarkable is that though he embraced Buddhism he accepted the diversity as the norm of society. One of his edicts says that a ruler must accept the diversity of his subjects’ belief. He did transform Buddhism in to a World religion. The spread of his ideas was not through force but through moral appeal and persuasion. His message was to reduce suffering and to pursue peace, openness and tolerance. This is why he is regarded as Great contrary to the said articles’ claim that he was great till he embraced Buddhism. Ashoka’s was the largest Empire in the history of the sub continent. His Dhamma was a moral code for the ruler as well as for the subjects who were exhorted to follow the moral path. His Rock Edict XII is something which we need to remember in current times as well as it has great relevance even today. It is a call for religious tolerance and civility in public life or as he puts it, ‘restraint in speech’, “not praising one’s own religion or condemning the religion of the others without good cause…Contact between religions is good.” (Sunil Khilanani, Incarnations, ‘India in 50 Lives’ page 52). ‘He did not foist his faith, Buddhism on his subjects…He is important in history for his policy of peace, non aggression and cultural conquest’. (R.S. Sharma, Ancient India, NCERT, 1995, 104) Ashoka inspired the leaders of freedom movement for his principles of justice and non-violence. He did represent the agenda which symbolized cultural and religious pluralism which were central to the ideology of Gandhi and Nehru in particular. His symbols of four lions adorn Indian currency and the wheel has become part of Indian flag. The problem with Ashoka’s rule was not the military one. His Empire continued till 50 more years. In 205 BC Greek Emperor Antiocus attacked from North West and established his rule in some part (North-West: Punjab, Afghanistan). The bigger problem was from within the empire. This is related to Brahminical counter reaction to the spread of Buddhism. Ashoka had put a ban on the slaughter for rituals. This led to reduction in the income of Brahmans. The spread of Buddhism led to the erosion of Varna-caste system. What the communal forces are calling as Vedic religion is as such the dominant stream which was prevalent then, Brahmanism. These factors led to the counter revolution. Pushyamitra Shung, a Brahman, the Chief Commander of Brihadrath, who was Ashok’s grandson, led the counter revolution. He killed the Emperor and founded the Shunga dynasty in Sindh part of Ashoka’s empire. The counter revolution launched in the society led to the disappearance of Buddhism from this land. Ambedkar writes, “Emperor Ashoka proclaimed complete ban on killing animals. So nobody engaged Brahmans to perform rites and rituals. The Brahman priests were rendered jobless. They also lost their former importance and glory. So the Brahmans revolted against the Maurayan Emperor Brihadrath under the leadership of Pushyamitra Shung, a samvedi Brahmin and the army Chief of Brihadrath.” (Writings and Speeches, Vol 3 P 167) Eighth Century onwards Shankara led the ideological battle against the philosophy of Buddhism. Buddhism urged the people to focus on the life in this World. The Shankara’s philosophy called this World as illusion and restored Brahmanism here in full glory. Due to ideological and social counter revolution Buddhism disappeared from this land around 1200 AD. So why is Ashoka’s reign coming under criticism now? Ashoka embraced Buddhism and this was a setback to the Brahmanical system. Brahmanism is the dominant part of Hindu religion as understood today. Ashoka talked of non-violence and promoted pluralism. All these stand totally against the Hindu nationalist agenda of sectarian nationalism where violence is part of the politics. This wants to promote neo Brahmanical values. So on one hand there is the attempt to co-opt Dalits and other hand the aim is to keep the ideological message of social hierarchy loud and clear and so Buddhism is attacked. The symbols of casteless ideology of Buddhism and accompanying respect for pluralism and peace are being attacked as a part of Hindu nationalist agenda, the garb in which it is presented is ‘weakening of India’ due to non-violence. As such Maurayan was an Empire, not a nation state, empires rise and fall due to social political factors of the time. Despite adopting non-violence the Empire continued well till 50 more years. The weakness starts coming in due to Brahmanical counter-revolution. The forays of communalists in the ancient Indian history are an attempt more to denigrate the Buddhist values under the garb of attacking Ashoka.